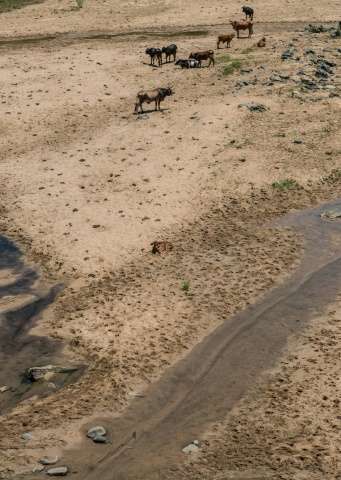 In the middle of a desiccated lake bed in South Africa's North West province, a seven-month-old calf is too weak to get up. It is doomed to die from thirst and hunger. 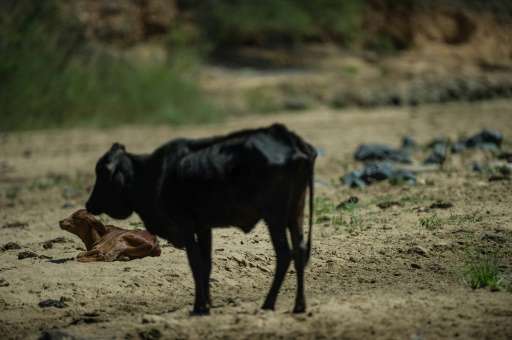 A devastating drought is claiming thousands of livestock in Africa's most developed economy and prompting many to fear famine. "God, give us rain because we have a big problem," Motsoasele prays, fearing widespread starvation. "We can't do anything." 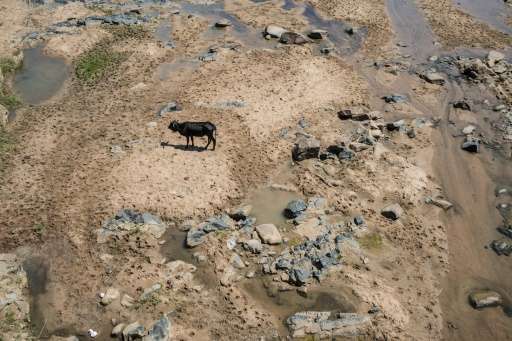 The drought, blamed on the global cyclical extreme weather system El Nino, is the country's worst since 1982. Located near the border with Botswana, the man-made Molatedi dam is the largest in the province of 3.7 million people. It is now only five percent full. "There's lots of animals dying on the farms," said Lardus van Zyl, chairman of the Red Meat Producers Organisation. Farmers are now auctioning their stocks before they die on their own and nearly a third more animals are being butchered compared to the same time last year, "mainly because of the drought," van Zyl told AFP. "In my experience it's worse than ever, in the past at least the cattle was surviving," said rancher McDonald Modise eyeing a carcass of one of his cows, which had died the previous day. Farmer Molemi Modise wrings a handful of dry grass. "It's so bad when it's get dry like this, even if the cattle feeds from this, it's useless." "If we don't get rain now I can assure you our people are going to die." "If it was normal, I was supposed to be planting maize, but now I can't do nothing," maize farmer Rykie Raphoto said standing in his empty field. "There will be no food for the nation," he said. The impact of the drought is massive for South Africa, the region's breadbasket, but could be dire for the rest of the countries in southern African region that traditionally import from it. Agriculture Minister Senzeni Zokwana warns of a "regional disaster" if the drought persists. "We have seen cattle dying, we have seen plants withering, we don't want to see people dying," he said. "We're looking at a scenario where we'll have to import," said Arno Van Vuuren, a senior official of the farmers' association in the North West. Five of the country's nine provinces have already been declared disaster areas and government has allocated 220 million rand ($15 million, 14.2 million euros) to help farmers buy animal feedstuffs. Sparked by a warming in sea surface temperatures in the equatorial Pacific, El Nino wreaks havoc on world weather patterns periodically, causing exceptional drought in some parts and floods in others.